Southern Utah University's Department of Theatre Arts and Dance through the Black Box Grants will present Molly & Peter on April 5,6, and 7th 2018 at 7:30pm. Performances will be in the Black Box Theatre, located in the Auditorium. Tickets are $5 cash or card at the door. 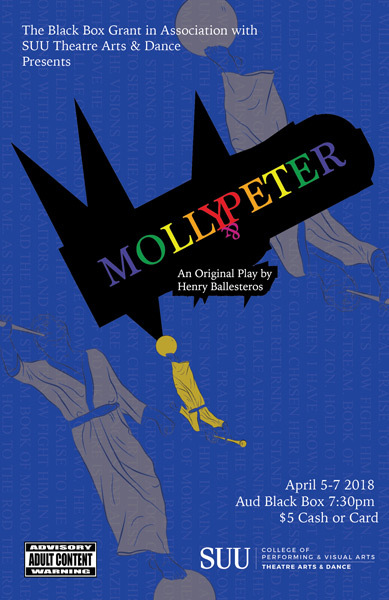 Molly & Peter is an original play written and directed by Henry Ballesteros, a Senior Candidate for the Bachelors of Fine Arts (BFA) in Classical Acting. This original work explores the dynamic of a typical family in a suburban community, and how outsides influences creep in and pull people in different directions. Set in the LDS community, we see a mother and father who are trying to understand what their son is going through as he tries to navigate his late teenage years. Based on real events and conversations, this play examines the culture within the Church of Jesus Christ of Latter-day Saints by following this LDS family as they deal with the outside world imposing powerful changes on their everyday lives. Starring Maycee Ham, Brandon Scott Grayson, Quinn Osborne, Karl Gardner, Spencer Smith, Cameron Martin, Brandon Bundy, Peyton Smith, Kenna Fullmer, and Amanda DeBry. Don’t miss out on your opportunity to see an original work by the students of Southern Utah University’s Theatre Arts and Dance program. Experience the show April 5, 6, 7 2018 at 7:30pm in the Auditorium Black Box Theatre. Tickets are $5 cash or card at the door.